It’s no secret I like to eat healthy and growing some good fruits to eat is a part of that. The only problem is it’s so hard to tell when fruits are ripe most of the time. One of the fruits that I always have trouble determining if its ripe or not is the pomegranate. It took some research and some effort on my part to get this right. Are you like I was and have a difficult time telling which one of these delicious super fruits is ripe for the picking when you look at them? Well I am here to pass on to you some of the knowledge I have learned about selecting ripe pomegranates. By the time you are done reading this article you will know exactly how to tell if a pomegranate is ripe. At first glance when you look at a pomegranate it’s hard to see much of a difference between them. Sure some might be a brighter shade of red than others but there will be other subtle differences that will let you know they may be ready to pick and taste great when you eat them. Ripe pomegranates do not have any green areas on their skin and should have very little if no yellowing of the skin either. Simply put, a ripe pomegranate will have a nice reddish color to it. That does not mean it can’t have different shades of red throughout its skin but it must be predominately red in color. Usually the redder a pomegranate fruit is the juicier and sweeter it will be. Here is a photo showing what ripe fruit on the tree look like. When Is The Best Time To Pick Fresh Pomegranates? 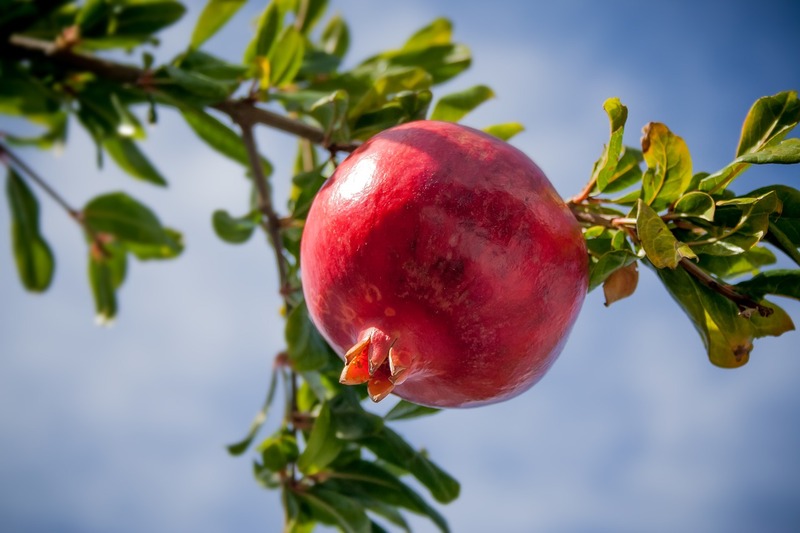 If you have a pomegranate tree in your yard or know of someone that will let you pick them there is one good way to tell they are ripe on the tree. You simply lift them up gently to feel the weight. Ripe pomegranates will be heavier than the other non-ripe fruit on the tree. Pomegranates get heavy when they are ripe because the seedlings inside them become overflowing with juice in them. That is a big part of the taste appeal with these fruit. 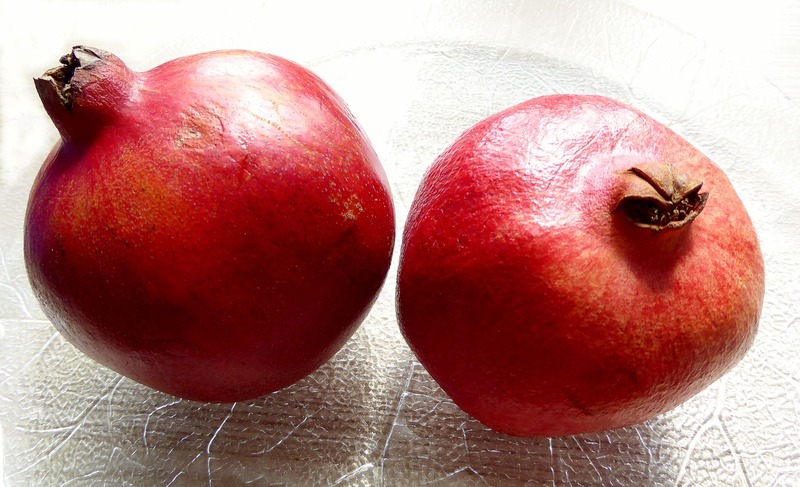 The main way to tell if a pomegranate is not ripe is by its size and colo﻿r. 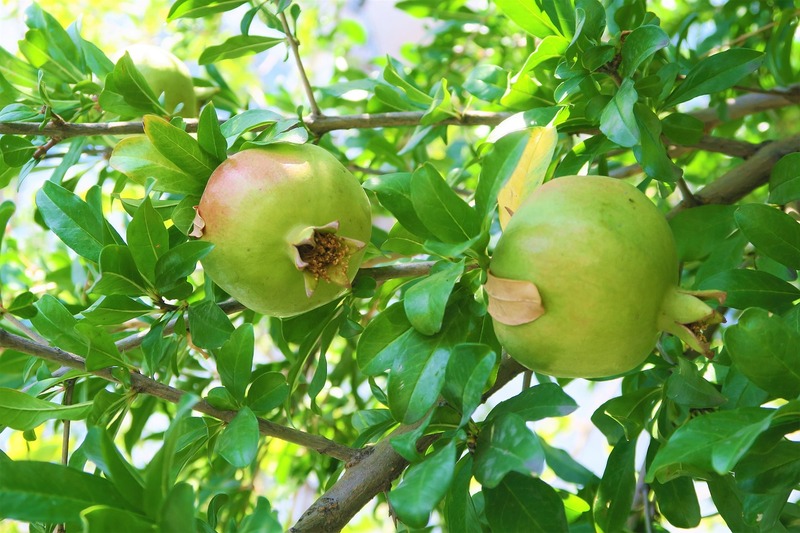 For one, unripe pomegranate are not nearly as full looking as a ripe pomegranate and have a much rounder shape to them. When pomegranate fruit first starts to appear they will be almost green in color. They still are not ripe even after they grow in size and change to a more yellowish/green shade with some red speckling found throughout it. Don’t pick them until they are predominately red throughout on the skin. There is no good reason to select an un-ripened pomegranate either. 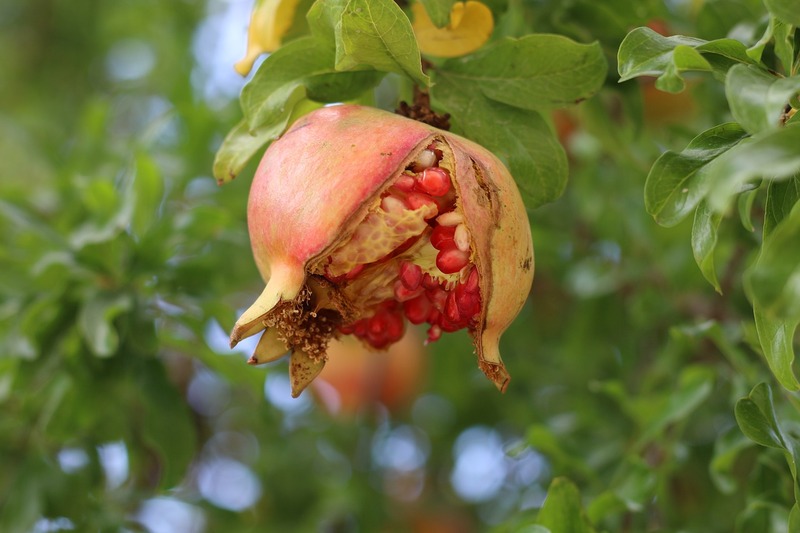 Unlike some other fruits that will continue to ripen even after they have been picked, what you see is what you get when it comes to the level of ripeness in a particular pomegranate fruit. Telling when a pomegranate is overripe is not a problem at all. I found out the disappointing way that a pomegranate will tend to split open when it is overripe. My small pomegranate tree does not produce a lot of fruit so you can imagine how upset I was when I walked out to it and saw several of the fruit broken open one day. They break open because its nature’s way of spreading their seeds. 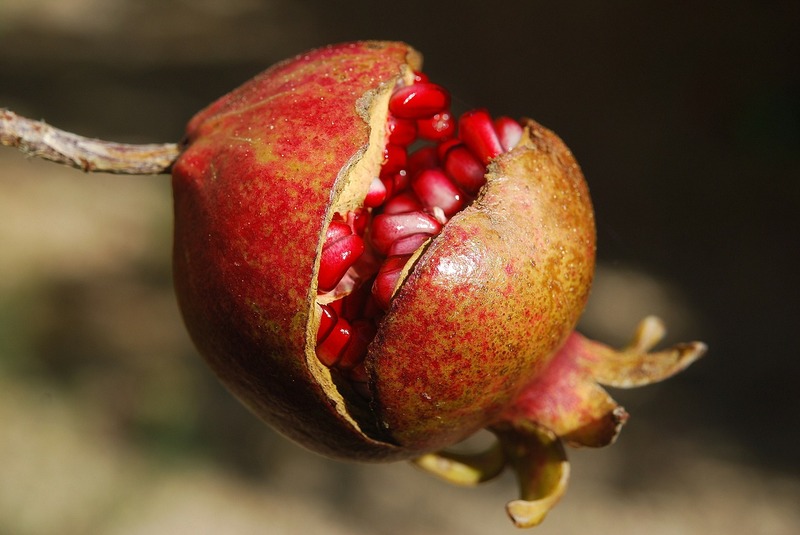 Once a pomegranate splits open it will lose a significant amount of its flavor too. Notice also in the photo that an overripe pomegranate fruit will start to lose its reddish outside color too. How Long Do Pomegranates Last Once Picked? One of the be﻿﻿st things about pomegrana﻿﻿te﻿s is they will last a long time even after you pick them. They can actually last up to several months if you store them properly. That is much longer than most other fruits. If you refrigerate them and seal them in plastic bags they will last you up to three months. So there you have it. The key to telling if a pomegranate is ripe is in its color and its weight. So it’s a good bet if a piece of pomegranate fruit is highly to the reddish side and it has a little bit of weight when you gently lift it, that piece of pomegranate fruit is most likely ripe and ready to eat. 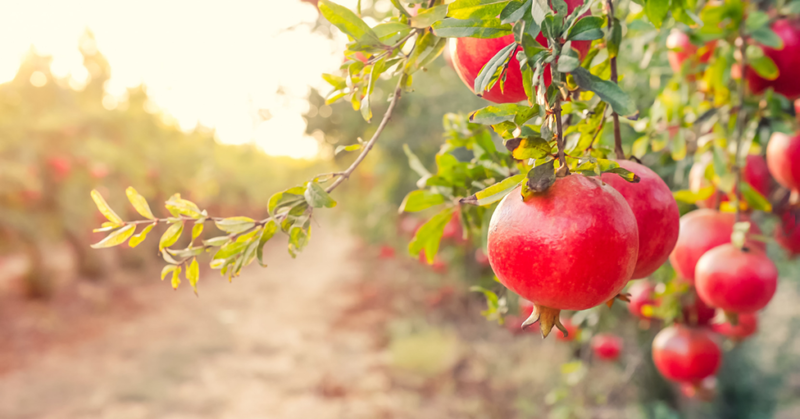 We hope this article has helped and in the future you will be picking only the ripest and sweetest pomegranate fruits on the tree. 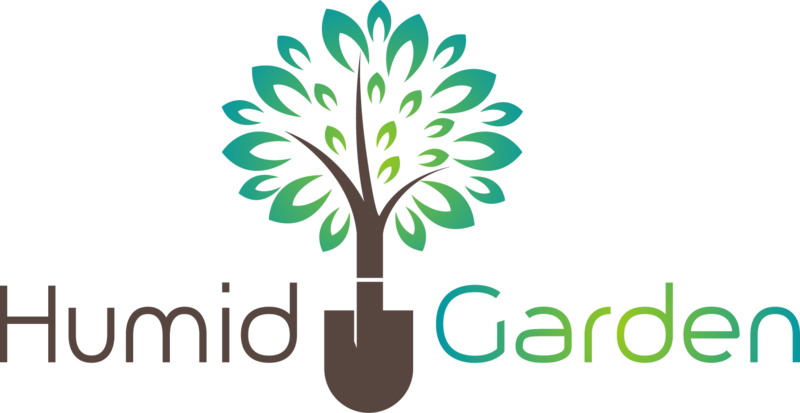 As always we welcome any questions, comments or additional input.